I usually like to start out a review with some descriptive line but in this case nothing will be able to describe this phenomenal read, so I will just say you have to go buy this book now. If you love contemporary or strong female protagonists I guarantee you will love this book too. This is definitely a breath of fresh air in young adult contemporary. You don't see many books about military schools, especially ones about females. I loved the setting of the military school it added a whole new feel to the book. It was very intense and left me on the edge of my seat. I know this is just a stand alone but I would have loved to read another book taking place at this school, it was so well written. The storyline was exceptional. It was able to cover so many bases in one story. You get to read about Sam and her life as a military brat. You get to see how it has affected her family and the struggles they are going through at home. The story follows Sam as she fights for the rights of females at the Denmark Military Academy and stands up for herself. And weaving through these storylines of real life issues and struggles you get an intriguing and dangerous mystery about a secret society. The story was well crafted and blended and I loved every moment of the plot and each sub plot. We all know in literature today it is hard to come across strong female role models as protagonists. Sam McKenna is one of the best I have seen to date. She stands up for herself, her family and friends, and what she believes in. She is a determined young woman who does not give up. Girls will love Sam and her story. She will inspire and motivate woman to act, believe, and stand up for what they want for themselves and the people around them. This is one of the best debut novels I have seen in 2014. Hensley hit it out of the park. I cannot wait to see more from her in coming years and already know I will be picking up her next book immediately when it comes out. 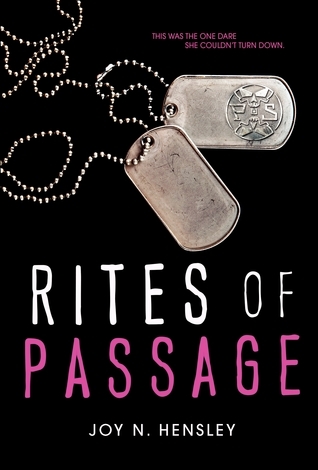 Rites of Passage is a must read!